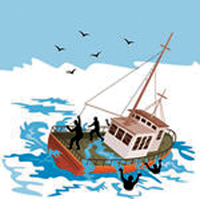 Three fishermen in a capsised fishing boat in mid-sea were rescued by Navy and Police personnel on Saturday, Habaraduwa Police said. The three fishermen from Palatugaha in Habaraduwa, Galle were fishing when they faced the mishap. The fishermen's boat capsised due to rough seas and they informed Police on the emergency number 119. Navy divers had immediately reached the spot where the fishermen had been clinging to the upturned boat and saved the fishermen, Habaraduwa Police said.